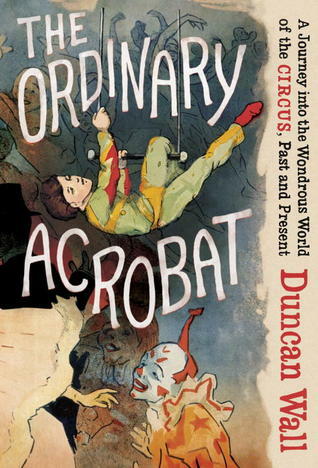 The Ordinary Acrobat occupies the literary territory between memoir, history, and anthropological report. Wall opens with his nod to the “circus memoir” genre, in which the author describes his or her first interaction with the circus, before jumping into the circus experience that captivated him, compelling him to learn more about the exotic culture and history of the circus. Not surprisingly, Wall was became fascinated with the circus while in France, a cultural stronghold for the contemporary circus. France classifies circus as a fine art, and it is governed by France’s Ministry of Culture, which puts millions into supporting the art and its state supported circus school annually. Wall researched this book from the enviable position (from my perspective as a scholar and a former circus performer) of a Fullbright fellowship and the ability to sit in on classes at France’s National School. In compiling the work, it’s clear that Wall also spent an immense amount of time speaking with circus professionals and historians, reading works of circus history and lore, and “chasing ghosts”—the name the author gives to visiting sites of circus history, even if there’s nothing left connecting the site to the circus anymore. When I picked up the book, I was worried that it would be heavy on memoir (What do I care about reading some circus neophyte’s memoir? I asked myself), but in fact, the memoir aspects permeated the narrative without overpowering it. Wall’s personal experiences tied the history and cultural observations together, propelling the story forward and providing a great sense of how the circus developed to where it stands today. Even though I’ve been involved in circus arts for about half my life, I learned a lot about the roots of the circus and how some of its traditions developed; some of which I had never even thought about. For example, the traditional red and gold circus colors and ring master look are based on military fashion. One of the first and most influential circuses (as we think of them today) was put together by Philip Astley, a retired cavalry officer. When he started his circuses, he based his shows on equestrian skills (a tradition that persisted until very recently, although still seen in “traditional” circuses today), and lifted most of his style choices from his military experience. Wall makes the point that such choices became codified into traditions that were handed down through the years between performers, resulting in the rather uniform look of circuses in the 20th century. The first skill that the author describes learning is juggling and he devotes three whole chapters (three!) to juggling and speaking to professionals. As a juggler, I was impressed; jugglers are typically the misfits of the circus (speaking as a juggler), and as one performer that Wall spoke with put it, jugglers are “heady.” Wall also described the problem with juggling performance: it tends to only really be appreciated by other jugglers. “Be hinging their craft of virtuosic execution, jugglers painted themselves into a corner. Although it is thrilling, this kind of technical juggling is tough for audiences to appreciate … Many tricks are harder than they look, and vice versa.” He also noted that since there is no inherent danger in juggling as there is in other circus disciplines, audiences sometimes have a difficult time connecting with it. Some jugglers have moved past this by turning it their acts into full blown art pieces. Wall spoke with juggler Jerome Thomas, who confided the secret to engaging the audience with an act as art: “You make him work his imagination … You make him dream!” The audience has to do some mental work in order to connect with the act, not just be wowed by a deluge of props cascading to the floor. At the end of the book, Wall discusses the cultural significance of circuses and compares the artistic landscape in Europe and the U.S. One of the best comments on this came from Bernard Turin, director of France’s National School in discussing why circus arts declined so sharply in the middle of the 20th century: “A popular art should bring people together. It should unify them and pull them upward. Unfortunately, television doesn’t do this, it pulls them downward. Instead of bringing people together, it isolates them.” This segues into something of a call to action from Wall. Circus arts can bring people of all social classes together, but in the U.S., we leave the funding of circus arts entirely to the private sector, so the artists we get really only end up working in corporations. No one starts troupes or shows because there is too much financial risk involved, thus leaving the American circus landscape devoid of new contributions and innovation. Circus can pull people upward, as Turin put it, and as someone who spent most of my youth in a circus environment, I tend to agree. I recommend this book for both people who have an existing interest in circuses (you will learn something!) and for people who don’t (it will endear you!). Like I said, I found that this book was a great way to get in touch with my circus “roots,” and I think that it’s a highly accessible work on the past, present, and future of the circus as an art form.